1) Hitch Hookup Height – measure and cut 1×2 lumber to use for indicating the correct height to hookup up the fifth wheel. 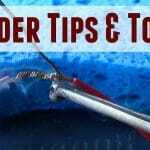 Lean wooden stick against the pin box and raise the front landing jacks until the stick falls. Stick can also be used to measure safe slideout distance by marking it with some tape. 2) RV Oven Tip – Use a pizza stone in the RV gas oven for more even cooking and to prevent burning food on the bottom of pans. 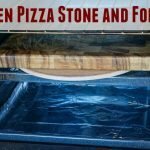 To keep the pizza stone from bousing and breaking store thick wood cutting board on top during travel. Bonus tip: Layer tin foil on the bottom of the oven to catch drips and splatters making cleaning easier. 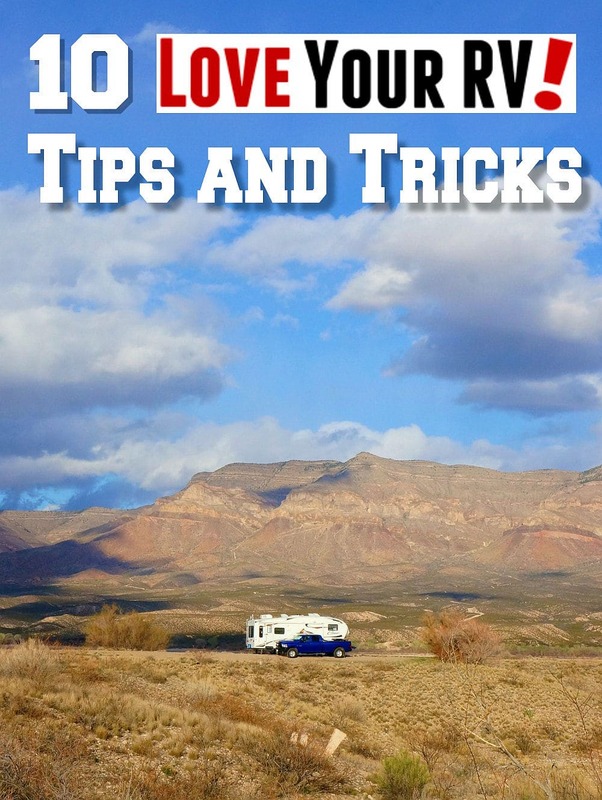 3) Fresh Water Fill Tip – For maximum filling of the RV fresh water tank I make sure the trailer is level or raised higher on the filling side. 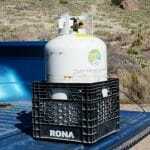 For dumping waste tanks, I do the opposite. 4) Dry Awning after Rain – Sometimes we don’t use our awning for weeks at a time and it would get moldy inside. By making sure to open it after every rain and let it dry for 10 minutes or so, I solved the mold problem. 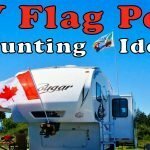 5) 3M Outdoor Mounting Tape – If you want to attach something light to the inside RV walls I have found the 3M tape does the job. I mounted a wooden carving over our entrance door and a few years later it’s still firmly attached. I find the “Outdoor” variety works the best, especially on rougher surfaces. One drawback is removal isn’t easy. 3M advises using fishing line to cut through tape them solvent to remove sticky residue. 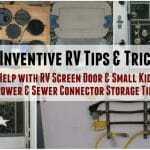 6) Prevent RV Plumbing from Freezing – Get a wireless thermometer and place it near the coldest plumbing pipes. To find the coldest plumbing location use an Infrared Thermonteror gun. 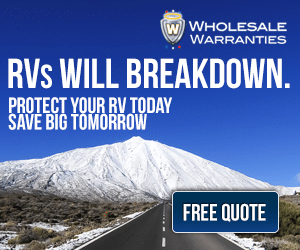 Now you can monitor the most at risk plumbing and take action before it and the rest of the RV plumbing can be damaged. 7) Remove Hard Water Spots – When in areas using well water such as the desert it’s not uncommon to find whitish hard water spots left over on the windows after washing the rig. To easily remove them fill a spray bottle with 50/50 mix of white vinegar and water. 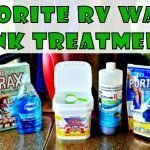 If you also do this to the painted areas of the RV, its a good idea to re-wax right away. Vinegar may strip some waxes. 8) LOOK UP! – Always a good reminder but even more so as spring is approaching. Our RVs are tall and it’s easy to forget to look above for obstacles. In the springtime, many of the seasonal campgrounds and parks haven’t had a chance to trim the trees back. 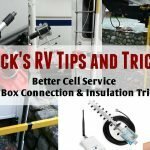 Don’t let your RV roof be the trimmer. 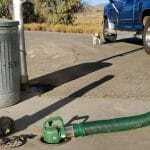 9) Trailer Safety Brake Cable – For fifth wheel owners always double check the emergency trailer brake cable is free for any entanglements and nothing can shift during travel accidentally pulling the plunger out. 10) Storing a Desktop Computer During Travel – Anne owns a large 21″ iMac. To keep it safe when we are towing the fifth wheel it gets stored in a custom built 2″ foam frame and laid face down. We also store it in the under bed storage area. Being right above the hitch connection it gets the littlies up and down movement.